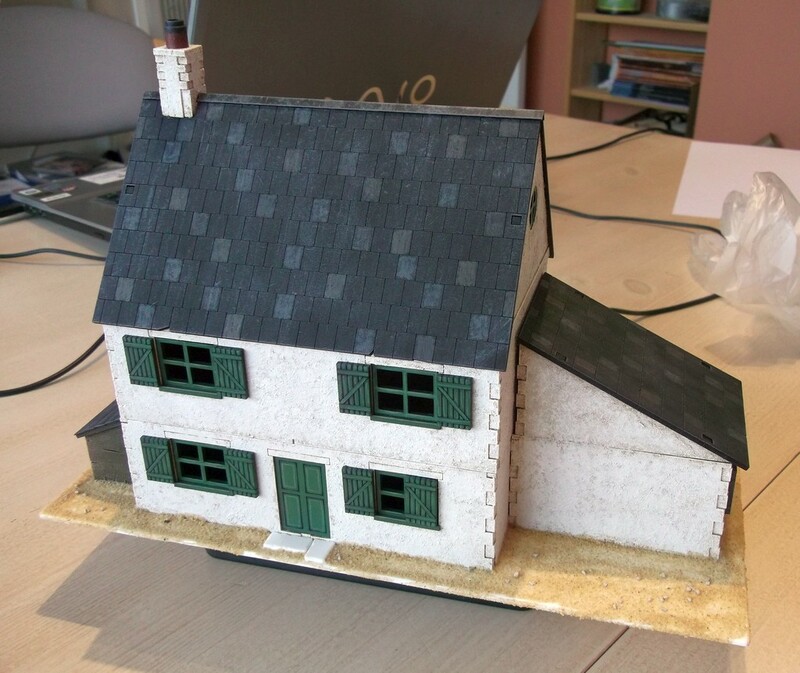 Matt continues putting the finishing touches to his Charlie Foxtrot Models "Farmhouse"
This post is all about taking the basic painted building and adding those little extras that will make it look a bit more interesting. 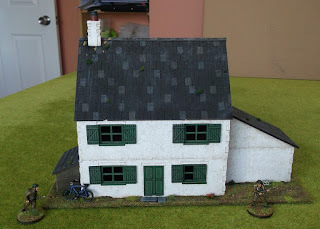 I think buildings always look better with a scenic base. 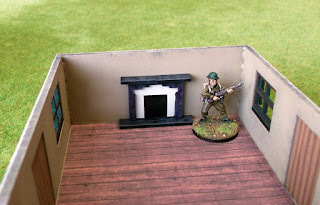 If you're ordering from Charlie Foxtrot then drop Colin a line to ask for a custom base. It will add only a small extra cost and saves you the bother of cutting stuff up. 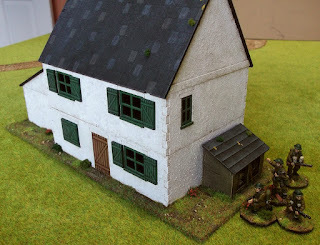 Alas, I forgot to ask for a base so here I've used a piece of 2mm plasticard. Glue the building to it with a few dabs of your favourite all purpose glue. The base is then covered in thinned PVA glue and a variety of grit/sand. 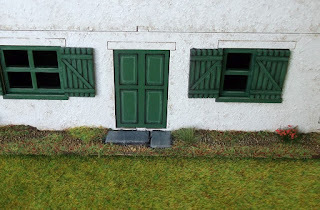 You can see that in front of the door I've placed a couple of pieces of thin plasticard that I've carved to look like flagstones. The sanded base can then be painted to match your other terrain or battlefield. My recipe is VMC Leather Brown base, then highlights of VMC Flat Earth, VMC Gold Brown and VMC Dark Sand. I use two different static grass colours, GW Scorched Grass and the lighter Noch meadow grass (ref 08310). The log store! 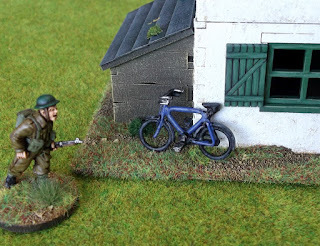 This was a fairly easy paint job. Spray mid brown then give the wood a solid base coat of any dark brown. I used Foundry Bay Brown Shade. Then dry brush with VMC Gold Brown and VMC Dark Sand. The logs got a heavier dry brush. 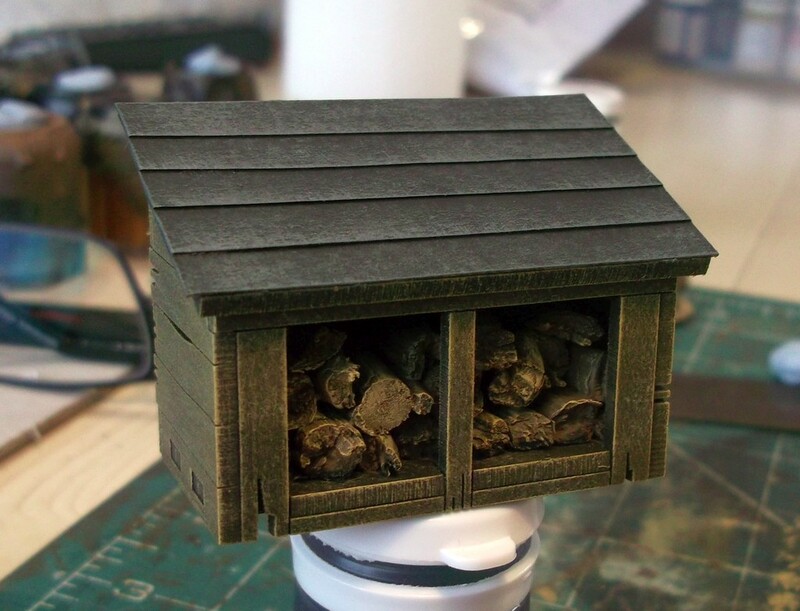 The roof was painted black followed by dry brush highlights of the Foundry Slate Grey triad. Here are the flag stones I mentioned earlier. Painted black followed by the Foundry Slate Grey triad. I've also added a few clumps of flower tufts here and there. To give the model building that 'lived in' look it's good to add a few everyday items. Here's a bicycle from the bits box. 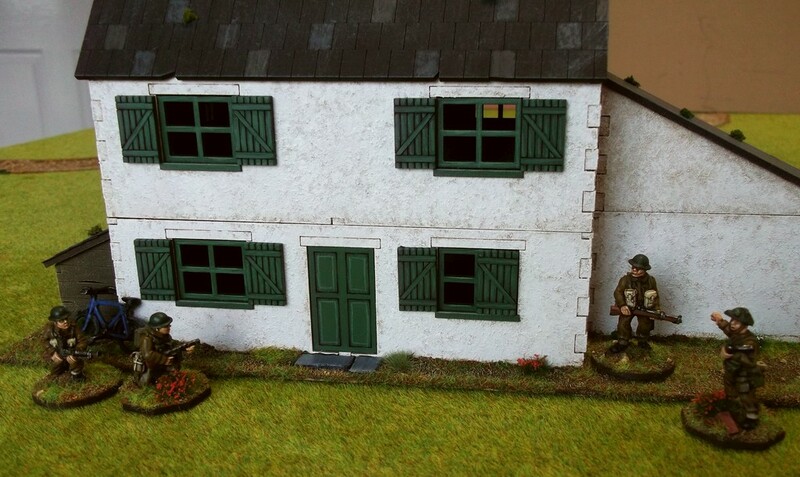 Buckets, barrels, logs, ladders (CFM do nice ladders) all make good extras - just remember to leave enough space for your figures! 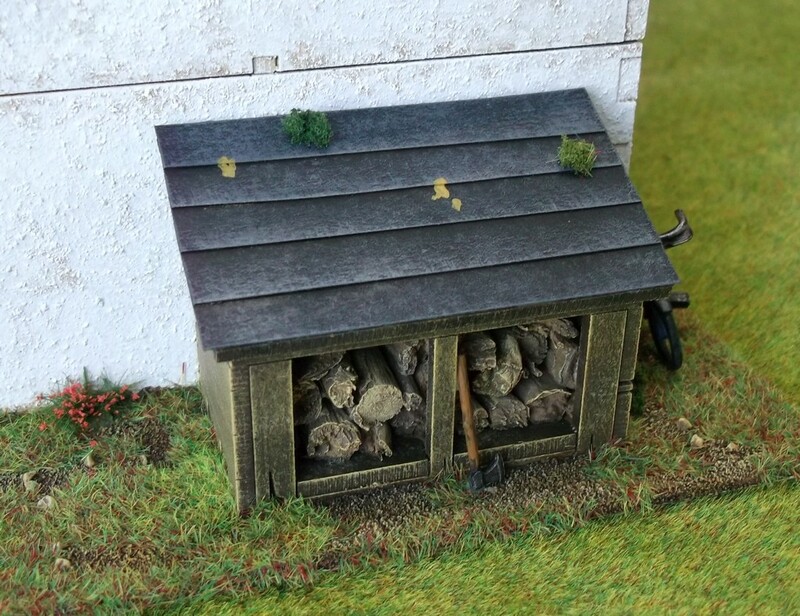 The log store - with an axe propped against it. The axe is a spare from the Gripping Beast Saxon Huscarls boxed set. 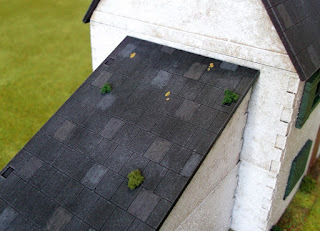 The roof sections have been 'enhanced' with some mould and lichen. Take a look at any real roof and you'll usually see yellow/orange mould, moss, bird droppings, etc. 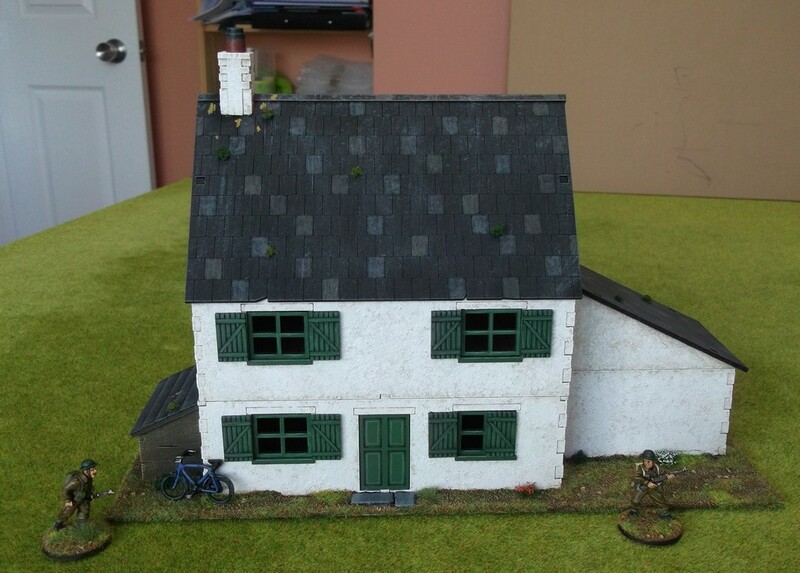 In the CFM shop you can see some excellent examples of this on Colin's buildings. 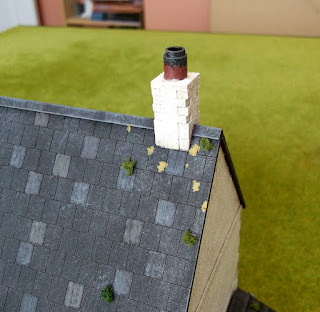 Here I've also added some soot to the chimney pot with black and grey. Now for the interior ... some might consider this straying in to doll's house territory ... but a few little features are worth the effort I reckon. 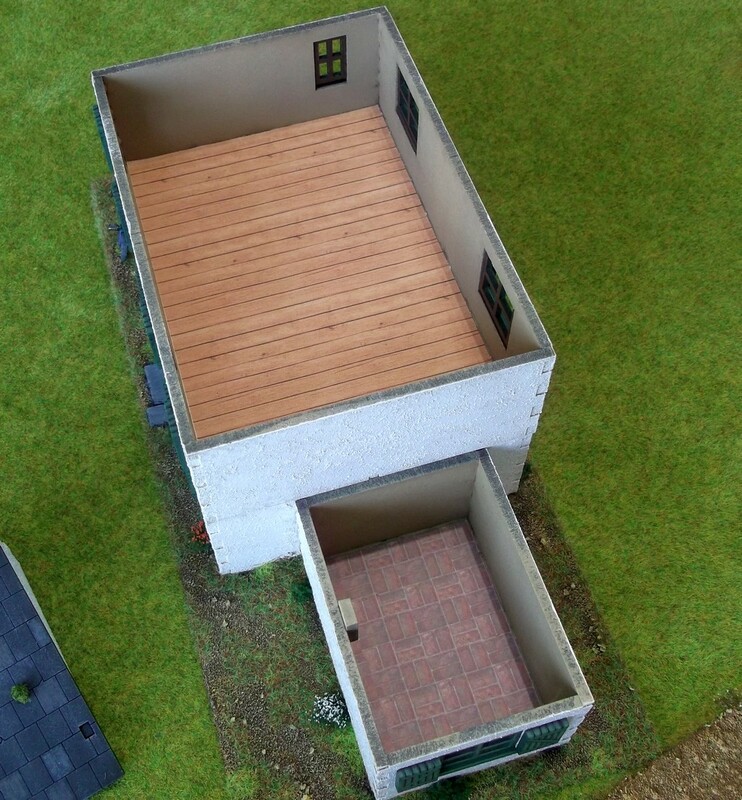 The downstairs has a fireplace plus some flooring from a (*cough*) doll's house makers blog. Just print, cut to size and glue in with a glue stick (don't use a runny glue otherwise the paper wrinkles!). 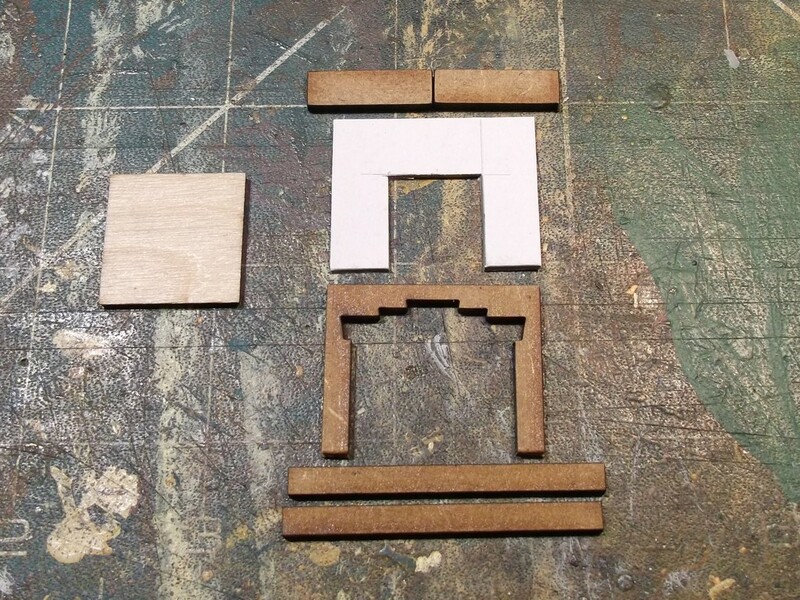 Here are the components of the fireplace - some left over bits from an MDF 'sprue' and a bit of card. 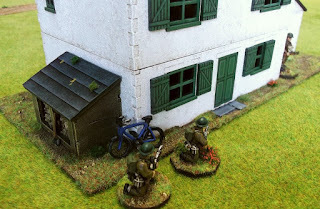 The 20x20mm square base is just for scale. The upstairs has a similar, lighter wooden effect printed floor whilst the extension has a brick tile effect. I've resisted the urge to add furniture! So here's the finished article. 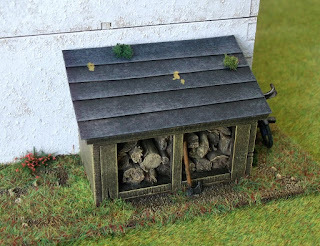 I hope you'll agree that adding some of these extras will make your wargames buildings a bit special. After all, I expect you put heaps of effort in to painting your figures? 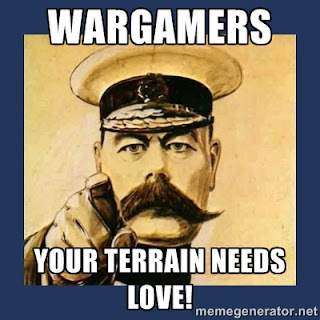 So do the same for your terrain!